A major tsunamigenic earthquake occurred off the Pacific coast of Nicaragua at 18.16 local time, (00h 16m GMT) on September 2, 1992 . The initial surface wave magnitude was estimated at 7.2 and its epicenter was at 11.761° N, 87.419 West, about 120 Kms West/Southwest of the city of Managua. The magnitude was later revised to a moment magnitude (Mw 7.6.) The main earthquake was followed by several strong aftershocks. Tsunami waves of up to 10 meters reached the Nicaraguan coast . The earthquake occurred along a convergence zone of subduction that has created the Middle America Trench (MAT). This is the region in the Pacific where the Cocos tectonic plate is subducted under the western end of the Caribbean plate. It is an active zone of stress and deformation, characterized by major, shallow-focus, and potentially tsunamigenic, erthquakes. Seismic wave analysis of the 1992 event indicated that this event was much shallower than other typical subduction-zone earthquakes. Analysis of the seismological record showed the fault motion of this earthquake to be unusually long in duration and occurring in the top 10 km of oceanic crust - a depth much shallower than that of typical subduction-zone earthquakes. It was determined that the magnitude of this quake had been underestimated because most of the seismic stations measured only seismic waves of short period. Short period waves had not been readily produced by this quake because ot its long duration of faulting. Subsequent analysis of seismic records made with long period seismometers showed that the moment magnitude of this earthquake was larger (Mw -7.6), and the energy release to be five times greater. In general, oblique, shallow subduction at a high rate of convergence which occurs along the greater portion of the Middle America Trench, results in northwest-trending crustal block motions that parallel the trench. However near Nicaragua most of the crustal motions are accomodated by "bookshelf " faulting. It is believed that such was the block motions that were associated with the 2 September 1992 earthquake. Additionally, the block motions were extremely shallow, occurred wihin subducted sediments and there was a lot of shear - thus the rupture was slower in speed. As for dimensions - given the fact that the tsunami struck hardest along a 220 km of the Pacific coast of Nicaragua - the fault rupture length is estimated to be between 220 to 250 km long. The width of the block is estimated to be about 35-40 km. Slip displacements are estimated to be up to 3 meters. The duration of the rupture lasted 100 seconds, which was extremely slow - thus the event has been characterized as a "slow" earthquake. A Slow Earthquake - The earthquake is characterized as a slow earthquake because of its slow rupture speed. "Tsunami Earthquake" - Because the earthquake generated a larger tsunami than what would be expected from surface wave magnitude (Ms -7.2), the 1992 Nicaragua earthquake is also classified as a "tsunami earthquake". 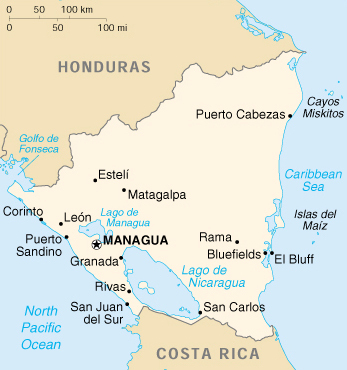 The earthquake of 2 September 1992 in Nicaragua generated a greater tsunami than expected from its surface wave magnitude, thus known as a 'tsunami earthquake". The unusual wave heights and greater destructiveness are attributed to the earthquake's shallow focal depth and to the slow fault rupture within subducted sediments. The earthquake generated a very destructive local tsunami which struck along a 220 km coastal section of the Pacific coast of Nicaragua with waves of up to 10 meters in certain areas. The first of the tsunami waves reached the coast of Nicaragua about 20 minutes after the earthquake. The first wave was relatively small but the second and third waves were higher and more destructive. Based on the plate tectonics of the convergence zone that has formed the Middle America Trench, on aftershock distribution, and on the fact that the tsunami struck along a 220 km of the Pacific coast of Nicaragua, the tsunami generating area is believed to be a somewhat irregular , broken up ellipsoid. Its major axis is estimated to be approximately 220-250 km and its minor axis to be about 35-40km. Its total area is estimated to be anywhere from 8,000 to 10,000 Km2. Slip displacements are estimated to be up to 3m. It is believed that the ellipsoid type of block movement occurred along an oblique but very shallow subduction angle. 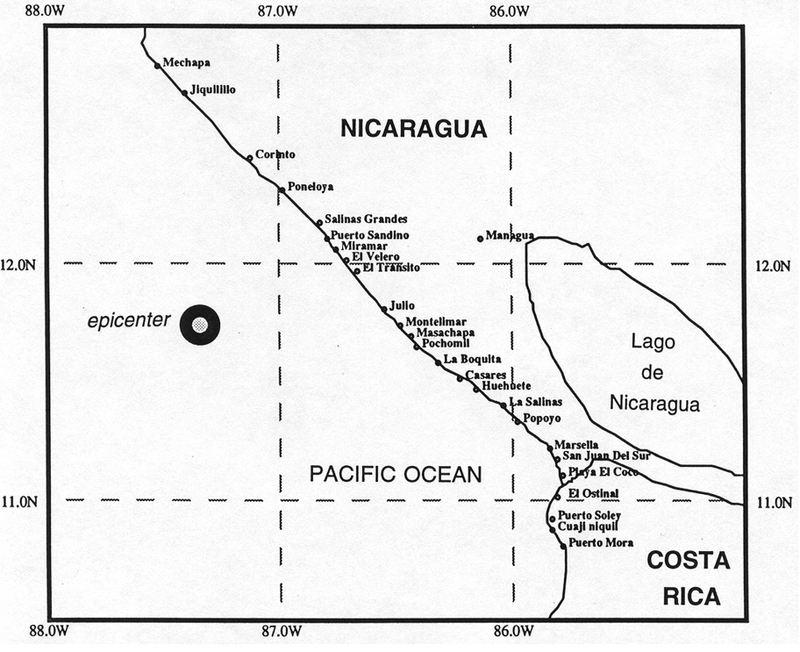 According to geologic studies of the offshore Nicaragua region - and in contrast to the northern belt of convergence, crustal motions near Nicaragua are accomodated by "bookshelf" faulting that may have an overall northwest-trending direction that parallels the trench, but may also include northeast-striking left-lateral faults. Additionally, most of the block motions occurred wihin subducted sediments with a great deal of shear which must have been the factor s responsible for the slower rupture velocity. Such a mechanism would explain the long duration of the rupture which lasted 100 seconds, and the sediment contribution to tsunami excitation, that characterizes this event as a "tsunami earthquake". The historic tsunami record shows that, prior to 1992, two other major earthquakes along this convergence zone generated two destructive tsunamis along the western coast of Central America. On 5 August 1854 an earthquake with an estimated magnitude of 7.3 generated a tsunami that struck Costa Rica. On 26 February 1902 an earthquake of magnitude 7.0 generated a tsunami that was extremely destructive in El Salvador and was responsible for more than 185 deaths. There was major damage to coastal towns and villages from San Juan Del Sur to Masachapa. At least 70,000 people living in the coastal areas of 27 communities s were affected by the tsunami. El Transito - Tsunami runup ranged from 6 - 9.9m. The maximum runup of 9.9m, occurred in the central part of the inundation area near El Transito. This extreme may be partially due to reflection of the waves. The waves were particularly damaging at El Transito, a small town of about a thousand people located about 55 km W of Managua. The town faces the Pacific openly without any breakwater or bank. It was the closest town to the earthquake's epicenter. According to local reports, waves of up to 9.9 meters destroyed most of the houses of this town (about 200), killed 16 people (14 children and injured 151. Fortunately, the first wave was not very large and people had time and managed to escape the second and third waves that were larger. El Popoyo - The maximumum wave height at El Popoyo was 5.6 meters. The waves caused extensive damage and killed 15 people. 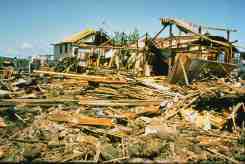 The most affected coastal communities by the 2 September 1992 tsunami in Nicaragua were also La Boquita, Casares and Huehuete . Other towns that sustained loss of life and damage to property were San Martin, Pochomil and Poneloya. Sixty percent of all houses were destroyed in San Juan Del Sur, a small town with 13,000 people. At Corinto, the tsunami caused extensive damage to food and fuel storage facilities. The town was partially protected by a large seawall . Fresh water wells were flooded by sea water. There were no deaths reported from other Central American countries but waves of 2 to 4 meters damaged harbors and boats in Costa Rica. An UNDRO mission that surveyed the area determined that the tsunami had an indirect or indirect impact on about 40,500 people in Nicaragua. According to the report a total of 116 people lost their lives, 63 were missing, 489 were injured and 13,000 were left homeless. The total death toll was later revised to 170 people. The tsunami was responsible for the destruction of most of Nicaragua's Pacific fishing fleet. Total property losses were estimated at around $ 25 million. There was no time to issue a timely tsunami warning for the residents of coastal areas in Nicaragua. The tsunami source was too close and it only took twenty minutes for the first of the destructive waves to reach the coast. Furthermore, there had been no studies assessing the tsunami threat for this area. The large tsunami which struck was a complete surprise - even to scientists. It was much larger than what would have been expected for an earthquake of that magnitude, and it did not behave in the traditional way. There were many lessons learned from this event - by the public, by government officials of disaster agencies ,and by scientists. Specifically, the unpredictability of this tsunami and the lack of a timely warning raised the degree of public awareness that the tsunami hazard in the region is very real and there is a need for programs of preparedness and public education. There were several reports by coastal residents in the area affected by the tsunami that they did not feel any strong ground motions when the earthquake occurred, so they did not believe that there was a danger of a tsunami and thus did not run to a higher elevation. Also survivors claimed that they did not hear the characteristic rumbling that a local earthquake would be expected to produce . This was in sharp contrast to the 1902 earthquake in El Salvador which was heralded by loud noises resembling the rumble of cannon shots. The 1992 quake in Nicaragua was "silent". Coastal residents only felt a minor tremor . They were totally surprised when waves of up to 10 meters arrived. Also , scientists learned from this event that each earthquake, even in the same subduction zone, can be different. As previously discussed, the energy release of the earthquake was five times greater - something that was not expected. It was learned that the quick dissipation of short period seismic waves from this earthquake accounted for the absence of strong ground movements and the lack of rumbling that the coastal residents reported. Scientists also learned that unusually large tsunamis can be generated by earthquakes, with slow fault motion occurring within subducted sediments. In fact, several similar earthquakes which have occurred around the world are now being called "tsunami" earthquakes, because of their higher tsunamigenic potential. It is now estimated that 5 to 10 percent of all tsunami generating earthquakes may be similarly "silent" "tsunami earthquakes" and that sediments play an important role in both faulting rupture velocity and tsunami generation. The 1992 Nicaragua earthquake was a good learning lesson for all - even the "experts". The 2 September 1992 event indicates that the potential tsunami hazard for the Central America region has been underestimated. Major tsunamigenic earthquakes occur primarily near the Middle America Trench along the intra-oceanic convergent margins of the Cocos and Caribbean plates - a zone of active, oblique, shallow subduction. The quantity and thickness of subducted sediments along certain sections of these margins can alter seismic focal mechanisms and the geometry and velocity of ruptures. Certain large earthquakes, along such zones, can be expected to be "slow" - that is to have lower rupture velocities and to generate seismic waves of longer periods. If measured with short period seismic instruments, the energy release of such major earthquakes will always be underestimated. The greater tsunamigenic potential of such earthquakes -along such zones of oblique shallow subduction - is not only the result of greater energy release but of the contribution of subducted sediments to the geometry of ocean floor deformation and volumes of displacements. 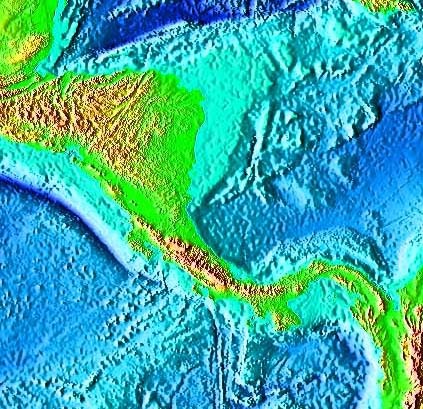 "Bookshelf" faulting of subducted sediments, as that which characterizes the offshore area of Nicaragua (and which probably occurred during the 1992 earthquake) can generate the so-called "tsunami earthquakes" that can be potentially more catastrophic. Aki K., 1992, Higher-Order Interrelations Between Seismogenic Structures and Earthquake Processes, Tectonophysics 211: (1-4) 1-12, Sep 30. Ihmle P.F. and T.H. Jordan, 1994, Teleseismic Search for Slow Precursors to Large Earthquakes, Science 266: (5190) 1547-1551, Dec 2. Ihmle P.F., 1996, Frequency-Dependent Relocation of the 1992 Nicaragua Slow Earthquake: An Empirical Green's Function Approach, Geophysical Journal International, 127: (1) 75-85 Oct.
Ihmle P.F., 1996, Monte Carlo Slip Inversion in the Frequency Domain: Application to the 1992 Nicaragua Slow Earthquake, Geophysical Research Letters, 23: (9) 913-916, May. Kanamori H. and E. Hauksson, 1992, A Slow Earthquake in the Santa-Maria Basin, California, Bull. Seis. Soc. 82: (5) 2087-2096, Oct.
Kawasaki I., Asai Y., Tamura Y., Sagiya T., Mikami N., Okada Y., Sakata M., and Kasahara M., 1995, The 1992 Sanriku-Oki, Japan, Ultra-Slow Earthquake, Journal of Physics of the Earth, 43: (2) 105-116. Linde A.T., Gladwin M.T., Johnston M.J.S., Gwyther R.L., and R.B. Bilham., 1996, A Slow Earthquake Sequence on the San Andreas Fault, Nature, 383: (6595) 65-68 Sep 5.